participants must upload a video or picture of you making your favourite All Gold inspired recipe using the Tomato Products. Post it on the Afternoon Express Facebook page, use the hashtag #MakeItTasteItLoveIt! And you could win! Competition closes: 17 September 2017 at 23:59 Terms and Conditions Apply. 1. This competition starts on the 14th of August 2017 and closes on the 17th of September 2017 at midnight. No late entries will be accepted. 2. The competition is open to all South African residents who are 18 years and older. 3. No director, employee, agent or consultant of the Tiger Brands Group of Companies, or their spouses, life partners, business partners or immediate family members, or the supplier of goods and services in connection with this competition may participate in this competition. 4. 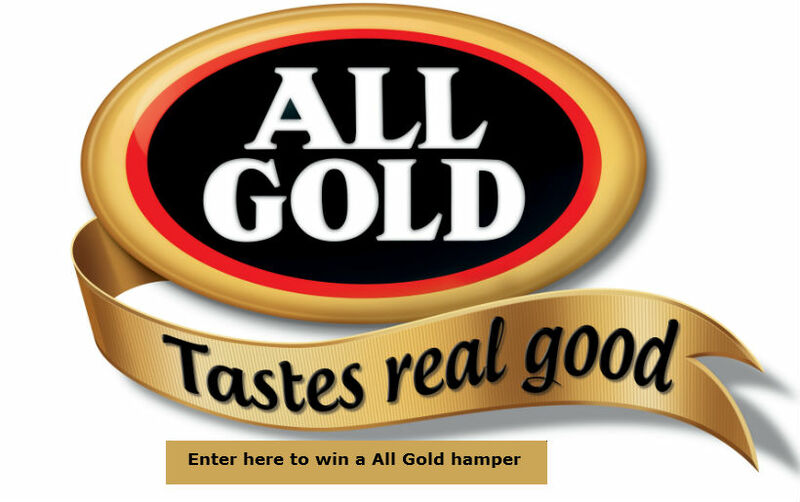 To enter this competition participants must share an image or videos of a recipe using All Gold products and tag the All Gold Facebook page or use #MakeItTasteItLoveIt. Social profiles must be public in order for the entries to be viewed. 5. Multiple entries are permitted but the prize will be limited to one per entrant. 6. The promoter is not liable for the failure of any technical element relating to this promotional competition that may result in an entry not being successfully submitted. 7. Entries which are unclear, illegible or contain errors will be declared invalid. 8. The prizes include 5 (five) All Gold hampers and 1 (one) grand prize All Gold recipe video featuring the grand prize winner’s recipe submission. The promoter reserves the right to substitute any prize with another prize of similar commercial value in the event of circumstances beyond its reasonable control. 9. Prizes may not be redeemed for cash and are not exchangeable. 10. The hamper winners will be selected randomly, one winner per week for 5 weeks. The grand prize winner will be selected by panel once the competition has closed and will be notified via direct message on their social account within one week of the selection having taken place. In the event that any of the winners cannot be successfully contacted within 1 week of contact and all reasonable attempts to do so the promoter reserves the right to draw another winner in substitution. 11. Any prize not taken up for any reason within one month of notification will be forfeited. 12. The winners may be required to sign a waiver of liability and indemnity before claiming their prizes. All winners will be required to provide their names, ID numbers and contact details and to sign an acknowledgement of receipt of the prize. 13. The hamper prizes will be delivered to the winners by courier to a daytime delivery address in South Africa. Any queries in this regard may be directed to the Consumer Services Division, on telephone number 0860 005 342 or at tigercsd@tigerbrands.com during office hours. 14. Winners may be requested to attend the draw and announcement of winners, to take part in the promoter’s publicity campaigns or to allow their names and likenesses to be used by the promoter for promotional purposes. Winners are, however, entitled to decline such request. 15. Where winners consent to take part in the promoter’s publicity campaigns, they will not be entitled to any remuneration for such participation and all materials arising from such participation will be the sole property of the promoter. 16. By entering this competition all participants accept and agree to abide by these rules. 18. The judges’ decision will be final and binding and no correspondence will be entered into. 19. A copy of these rules can be found on the All Gold Facebook page and www.allgold.co.za throughout the period of the competition or can be obtained from the Consumer Services Division.